When you think about a wheelchair ramp for a residential application, you may first think of a large modular ramp — but there are many EZ-Access models of reasonably priced lightweight portable wheelchair ramps for homes that solve step and door threshold accessibility issues, and provide safety and convenience at your front door. If you have a door threshold access issue due to wheelchair, scooter or walker use, contact Atlanta Home Modifications, LLC at 770.880.3405 for help in selecting the right size and style of threshold ramp for your home. You can order through us, and we will have the ramp sent directly to your home. The main type of threshold ramps that solve the common height differential of 2″ to 4″ found at door entrance areas, are high-strength aluminum threshold ramps with a non-skid surface that fits neatly in place as a small ramp at the door. 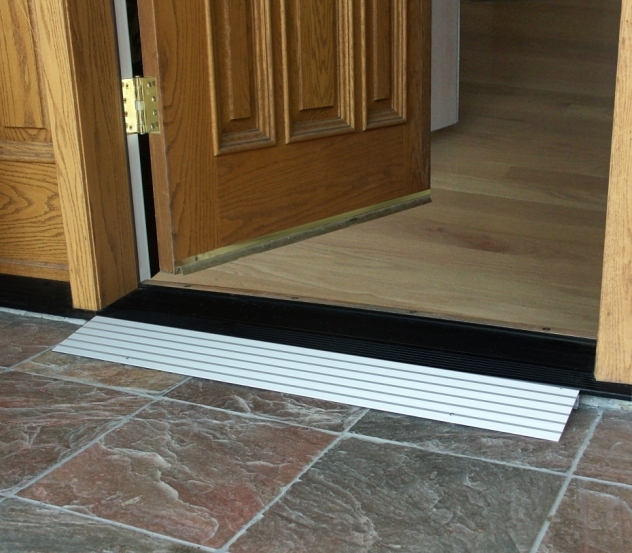 Available in 1, 1½, 2, 3, 4, 5, & 6 inch heights, (determined by the door sill height) the EZ-Access threshold ramp is a lightweight ramp made for all types of doorways and raised landings. Easily installed, this lightweight portable EZ-Access threshold wheelchair ramp for homes solves even the most challenging accessibility issues. It supports up to 600 pounds and includes a 3-year limited warranty. It is manufactured in the USA. Contact Atlanta Home Modifications, LLC at 770.880.3405 for assistance with size, pricing and ordering information.